James M. Lang: Academic Integrity Campaigns--Involve Your Students! Academic Integrity Campaigns--Involve Your Students! One of the most consistent findings from the research on cheating in higher education is that students are more likely to cheat if they see that cheating is both common and approved of by their peers. This makes perfect sense when we consider that in most cases we are working with students in their late teens, a time when peer approval matters in almost every aspect of their lives. The obvious implication of this finding, for me, is that we have to involve student leaders, student athletes, and students more generally in academic integrity campaigns. We need students to be the ones who demonstrate to others that they do not approve of cheating. On my campus we are working with a marketing class next semester to help design a campaign that features our most visible students on campus talking about the importance of academic integrity. A couple of weeks ago I had the privilege of giving the keynote address at a campus academic integrity event at Lamar University in Beaumont, TX. Hung around the room in which the event took place were an outstanding series of posters that had been designed by student in a graphic design class at Lamar. It was inspiring to speak with faculty about academic integrity in the presence of these absolutely gorgeous, student-designed posters. Kudos both to the students and their professors and to Melissa Hudler at Lamar for organizing the event and helping to publicize the posters. Please make sure you click through to view the posters, and if you know about or have been involved with academic integrity campaigns that enlist the help of your students, post a link in the comments or send me an e-mail so I can let others know about it. 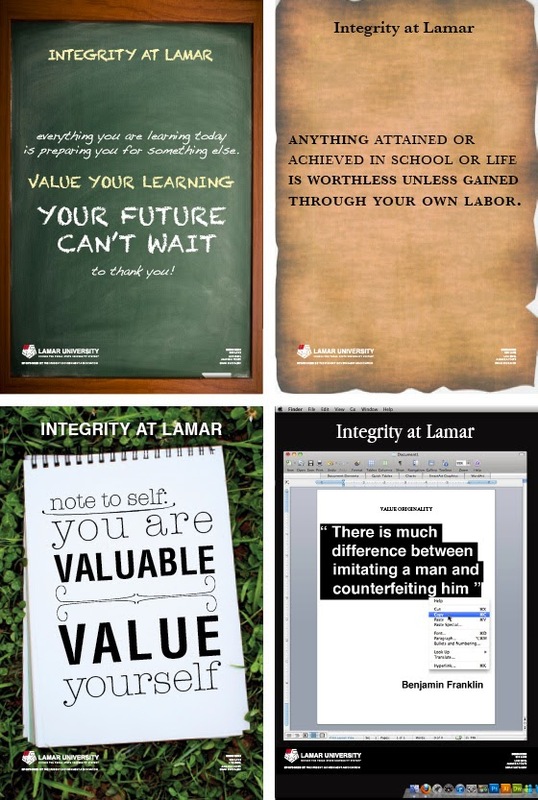 We should continue to share great models like Lamar's in order to work together to promote academic integrity in education at all levels. Thank you so much for bringing attention to Lamar's academic integrity campaign and especially to the issue in general. Student buy-in is indeed vital to such an initiative, so I think your university's idea to feature student leaders in the campaign is an excellent one. I wish we had thought of that! We were certainly honored to have you participate in our Academic Integrity Symposium and appreciate your continued interest in our project. All best wishes for a successful campaign!